Schools, Sports Teams and Local Businesses Can Make a Big Impact During Breast Cancer Awareness Month! 1. The Team Lead must SET UP a fundraiser page. After your campaign is set up, you’ll see a tab for “Manage Team”. Anyone you invite will be added under your team fundraiser page. 2. Buy a tutu from us, a local store, or make one! We have bulk pricing for orders of five or more. Nothing shows more goodwill than when a group gets behind a cause together! Think you can get your entire team, principal, yoga studio or even your Mayor to #Dare2Tutu? Get an entire organization involved in our breast cancer fundraiser and as the leader, you can win a Tutu Project print, limited edition Ballerina book and more! Motivate your friends, family, and co-workers to join in the movement by asking them to take pictures with you and donate to your personalized fundraising page. WE WANT TO SEE YOU #DARE2TUTU! 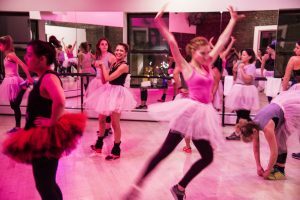 Advocate Meredith Fortier led the charge and convinced studio owners Jacey and Danielle at Jane Do in Jersey City to dedicate an entire workout class to #Dare2Tutu! The Studio was thrilled to donate the registration fees for the class and also sold tutus and calendars on site the night of the event. We were lucky enough to attend the event, and had a blast watching these men and women rock out in honor of women and men with breast cancer! 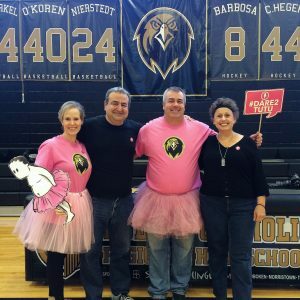 Hudson Catholic Regional High School involved their entire community in their efforts to fundraise for families with breast cancer. Their campus ministry program is designed to encourage individual development and responsibility to the community. 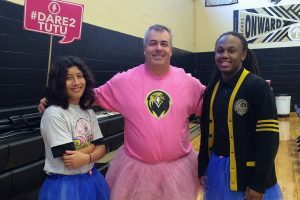 Their sports teams wore tutus to events and encouraged their families to donate on and offline.